The following correspondence is unedited; some letters have been excerpted. I placed [a copy of the Boilerplate book] on my son's bed when I got home and forgot about it. When my 8-year-old got home from school I noticed after a time he hadn't run off downstairs to catch Sponge Bob as per usual. There he was sitting on his bed slowly leafing through Boilerplate. He was fascinated with the book and he pretty much spent the rest of the evening going back to it for second and third looks. I haven't seen him that intrigued with a book... I think ever. My son has asked me what happened to Boilerplate. I told him he would have to stay tuned as they say on TV. Then he asked if he could get a Boilerplate figure or build one (he pointed out the diagram on page 19). I said I'd see what I could do. You and Paul have got a new young fan. Thank you for that. Your book rises to the level of Michael Chabon's "Adventures of Kavalier and Klay" in telling a more accurate historical tale by using fictional characters. 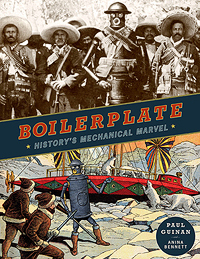 Boilerplate is a wonderful character, idea and persona; it serves as a mechanical Everyman moving through a turbulent era of history. In your fictional world, Boilerplate is drawn to people who are extraordinarily alive and humane even though he is neither, and all of them project those values on to him. The book radiates love for humanity, compassion for ordinary people and the kind of sefless integrity we were taught in Boy Scouts in the 1960's. Indeed, Boilerplate kind of looks like an original Boy Scout. There are, of course, interesting parallels to many similar works, but you've come up with a uniquely humanistic robot story. After reading about you and your wife on your web site, it became clear to me that you two are like the characters you selected in your history -- unbound, free-thinking, joyful and loving. You must be quite a couple. Boilerplate is a great "baby" for you. Just wanted to take a moment to tell you how much I enjoyed Boilerplate, it was FANTASTIC! I came across the book in a discussion of Stumptown after seeing your book won Best Writing and Best Artist, I ordered it sight unseen. The amount of time, passion and effort that went into crafting this confounds me. You have such a deft touch with Photoshop (or whatever program you used), being able to replicate the tones and textures of each medium. My personal favorites? The boxing scene with Jack Johnson. The Hanna-Barbera esque cartoon. And the Teddy Roosevelt group photo. Amazing. In addition to buying and enjoying the book personally, I discussed it tonight on our show. I’m one of the co-hosts of 11 O’Clock Comics, a reasonably popular comics focused podcast. We spent a good bit of time this week discussing your book. Hopefully it’ll help sell a few extra copies. Nothing would make me happier. As I often do, I was browsing and skimming here and there on the internet when I stumbled on an article on "steampunk" (it might have been in Slate). A generous portion of space went to Boilerplate, and the book seemed intriguing enough that I felt I had to own it. So I ordered it from Amazon. I was totally surprised by just how beautiful the book was, literally from the front to the back cover, and everything in between. My assumption was that it would be a book comprised of quirky and clever photoshopping with little portions of odd text thrown in here and there. Instead, aside from the photoshopped stuff, it was chockfull of period art (or period-appearing art), actual photographic artifacts, insets, countless sidebars in text-appropriate typefaces, all meticulously detailed enough to present the verisimilitude of a previously undisclosed archived story, in an expensive text book. If our current civilization were destroyed and Boilerplate were to remain extant, it might confuse a civilization ten thousand years from now. This is so unique and original, I can't praise it enough. I love this sort of thing, so I consider it a masterpiece of conception. The only way to own this is in hardcover. The paperback will diminish its realism. I read the credit page at the end, with the information about the two of you, you and Mr. Guinan. I have to check out your other stuff. What a pair the two of you make. You're blessed with an astonishingly quirky originality that when actualized transcends its own drollness. You and your work were unknown to us until your booth became the final stop for me, my wife, and daughter on our way out of WonderCon a few weeks ago. I am almost done with Boilerplate now and with every page I am amazed at the creative genius that went into this work. The concept, the fiction, the history, the layout and the compositing work are all outstanding. I don't know if you did the Photoshop work yourself, or the design staff, but it alone is worthy of every award in the book. Helping me recall my long-ago history classes is a wonderful bonus. As an amateur writer, photographer, desktop publisher and Photoshoppist(?) myself, this is almost a dream book (right up there with the Star Trek Technical Manual of my youth!) I can't help but be blown away by the quality of this work and the creative inspiration it instills. I hope someday I can do something half as good. My daughter, Liz, a self-proclaimed "steam punker" who just accepted her admittance to attend CalPoly as a history major, is equally impressed and can't wait to steal my copy. (As we briefly discussed at the show) I'm still having a hard time with that creepy bullhorn mouth ;^) but this is definitely going to be one the most cherished books in my collection.